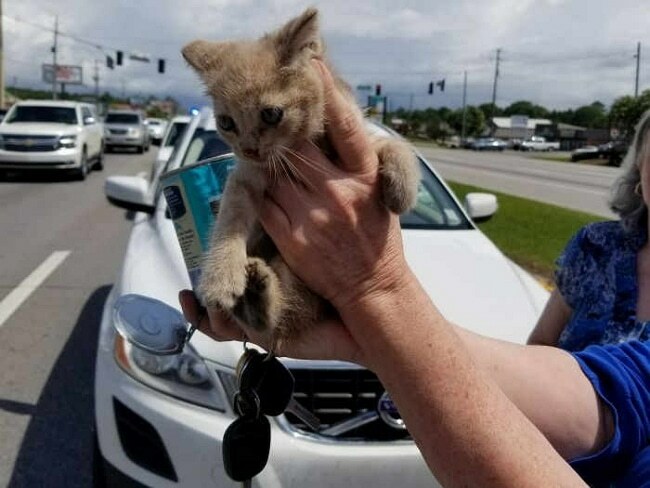 An SUV stopped on Highway 49 in Mississippi, to avoid hitting a tiny kitten in the traffic lane. Scared, it then climbed up into the vehicle’s engine. An SUV stopped on Highway 49 in Gulfport, Mississippi, to avoid hitting a tiny kitten in the traffic lane. Scared, it then climbed up into the vehicle’s engine. An area firefighter who had stopped to assist noticed the kitten was climbing through the hot exhaust system. While the Highway Patrol took control of traffic, several Good Samaritans helped get the kitten to safety, the driver of the SUV then taking the kitten, who appeared to be unharmed, for care.